My new frisbee has arrived - 11 Discs altogether. 10 From Discraft and 1 from Flashflight (The Red LED). The white discs (3 of it)I'll be selling it for BND$20 and rest will be for my personal use. Currently, I have more than 15 discs and I'm planning to buy other colors such as pink, red, blue, etc. 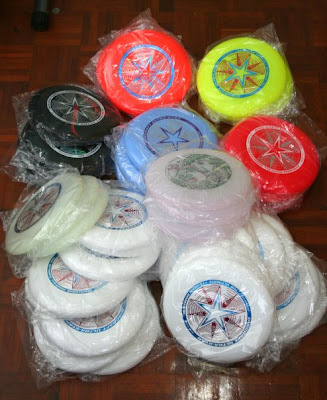 i'm interested to get ur frisbee...cana kan contact? my frisbee already sold out but my friend radzi still have a lot of stock. to buy, you can come during our ultimate frisbee fun day at Jerudong Park Playground grass field near the main entrance every Sunday from 4:30pm to 8pm. You can look for me Bahar or Radzi. assalam , masih kamu bejual disc ani ? I'm interested to buy one or two . hye, how can i buy this disk from you?